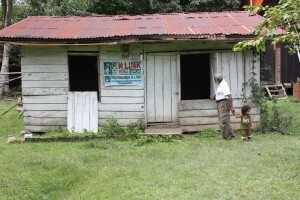 If you take a 5 hour drive along rugged roads north of Jayapura in Papua – you will be likely to come across a little shack on the side of the road – this is Father Abraham’s clinic. Abraham is a retired medic of 35 years experience who runs this clinic as an outreach to poor Papuan families in the region, he also has a smaller outreach clinic afurther 20 minutes away. Buzz Off has been helping Father Abraham for two years with a steady supply of antimalarial medicines. Over the coming months we want to increase this to include access to RDTs, LLIN nets, Haemoglobin testing kits, and other support medicines. The video above explains a little about this clinic and how Buzz Off will be helping to support it in its fight against malaria. Donations towards this project can be sent via the Australian Mercy secure site.